The view from the top of the valleys. March was a blur — the first half of the month was basically just me panicking and trying to finish my dissertation. I eventually got the first full draft done six days before the deadline, and then I spent a few days editing it before sending it off to print (which cost me more than I was happy to pay. You have to get two copies done, and because I do Creative Writing I also have to print off my drafts. £8000 a year and we have to pay to print? Sort it out, universities). The sheer relief once it was finally safe in the office was everything though. It hasn’t all been work though — I’ve had a few nice meals out, including yummy duck and orange fajitas at my favourite Mexican restaurant, and I spent a lovely sunny afternoon exploring the Welsh valleys with two of my housemates. 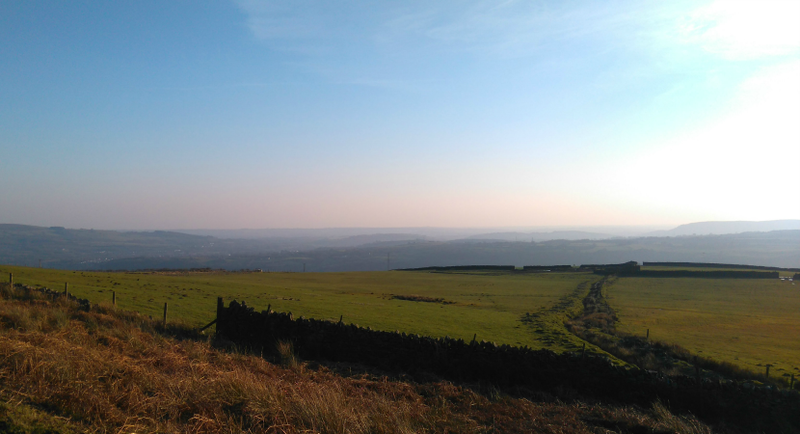 We drove up to the top of the hills and stopped to admire the view, and it was just beautiful, one of those moments when time seems to stop and everything is peaceful (well, at least it was until Llion nearly drove the car down a ditch). I really do love Wales. I watched… England’s Six Nations matches. We won the tournament and we won the Grand Slam (on my birthday, no less, which made it that little bit sweeter) and I was so happy because I was in Wales when we crashed out of the world cup and it hurt, and just seeing how much the team have started to improve makes me very excited for future games. I don’t know why, but I get so emotionally involved with the rugby — I even follow the coverage on The Guardian. If you’d told me that two years ago I would have laughed in your face. Side note: if you’re also a rugby fan — even if you’re not, actually — and you fancy a giggle, just watch this video of Billy Vunipola lip syncing to Backstreet Boys (skip to about 18 seconds). You’re welcome. I read… Yes Please by Amy Poehler. My brother got me this for my birthday (cheers, bro!) and I was hooked from the moment I read the first page. I sped through it in a matter of days, even though I was supposed to be reading something else (oops) and I thoroughly enjoyed Amy’s humour and honesty. I would like to be like Amy Poehler when I grow up, please. I listened to… Hold On by SBTRKT, When We Were Young by Adele, and Sitting Waiting Wishing by Jack Johnson. I bought… Not much this month, actually — I’ve been cooped up in the library too much to really go shopping (plus I did spend quite a lot on undies in February. Needs must). I did get a couple of tops from Zara, but that was it. Product of the Month: It’s a tie between the Pixi Glow Tonic, which really is as good as everyone says, and Charlotte Tilbury Eyes to Mesmerise in Jean (a pretty, fuss-free cream eyeshadow). How was March for you? Did you get into the rugby as much as I did? Let me know in the comments!